I get it. Life as an Amiga has its challenges. We are often stretched in so many ways…. Kids, cases, relationships, business management, and more. We love it all but we struggle doing it all. I have been there. I was not running my firm to its fullest potential. I was not making the amount of money I wanted to make and I felt like my work/life balance was off. I needed support staff but I didn't think I could afford it. Better office equipment would have made a big difference, but I felt limited by my monthly payments. I MADE A DECISION THAT CHANGED MY LIFE. I decided to treat my law firm like a business. Instead of the founding partner of my firm, I became the CEO. I realized I needed to learn what a CEO knows. I filled my desk to the brim with business and law books from my bar and local libraries. I spoke with other solos. I read articles. I immediately started to implement small changes, and my firm suddenly started to take off. This was not solely a matter of clients coming in the door, rather it took streamlined procedures and processes to increase revenues, client satisfaction, and work/life balance. I felt so empowered by the changes that I made in my business, that I wanted to find a way to share everything that I have learned with others. I also wanted to find a way to help newer lawyers who need additional hand-holding when getting started with removal defense. Both managing a solo practice and beginning a career in removal defense shared the same problem: lack of meaningful resources. Not one piece of advice in all of my research touched on marketing to and working with foreign clients, which for immigration lawyers, is our only clientele. I could not find anything out there that offers stand-by-your-side, guide-you-through-each-step-of-the-way assistance for new lawyers who are breaking into removal defense. Here's the truth: I LOVE seeing people succeed. I want to support other lawyers who were like me, looking to make important changes in their case work and their businesses. I am proud to share with you that I have rolled out a Coaching and Consulting program to help you Get Going, Keep Going, and Go Further. I want to be your business cheerleader. I want to be your removal defense guide. I want to help you achieve your goals. 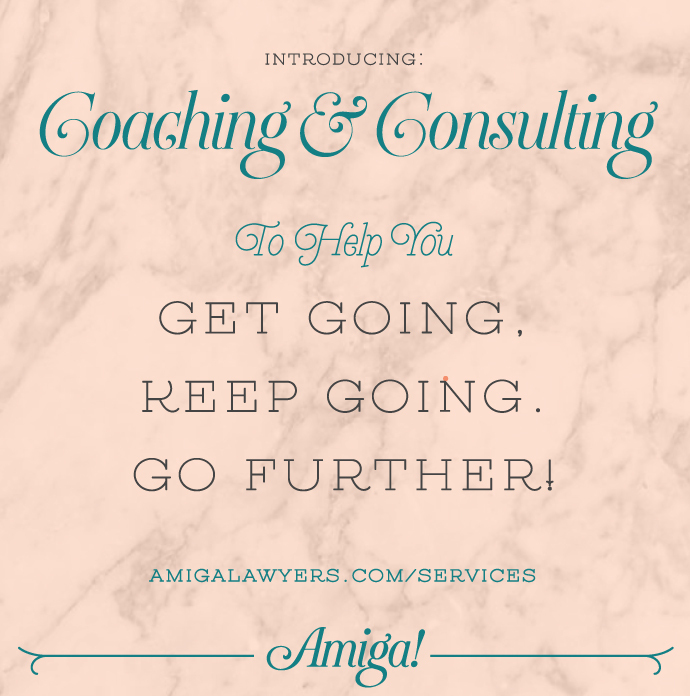 Hop on over to www.amigalawyers.com/services and find out more about how we can work together to help you get there. I can't wait to meet you on Skype!